The Minocqua No Frills Marathon™ & Half- Marathon keeps it simple and affordable because, at this marathon, it’s all about the race. The race accommodates those who aspire to run their first marathon, as well as veteran runners trying to better their times or qualify for the Boston Marathon. Online registration at tandhtiming.com closes at 11:59 PM on Friday, August 30. Only those that register online are guaranteed a shirt. Complimentary shuttles (for racers only) from municipal parking lot on Hwy 51 downtown Minocqua near Minocqua Post Office, 126 W Front Street. Shuttle bus will leave at 6:00 am for regular marathon and 7:00 am for 1/2 marathon runners. (No early bus this year). Aid Stations at mile 4-6-8-10-13-15-17-19-21-23-Finish, all with water and Gatorade and some with snack. Custom die-cast finishers medal with FREE name and time engraving by Bassett Jewelers and Engraving located in downtown Minocqua at the corner of Oneida and Front Street. Bag transport back to finish line from start area. 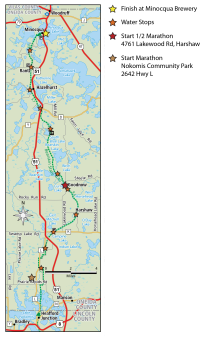 The Minocqua No Frills Marathon™ is a point-to-point course, beginning at Nokomis Community Park on Highway L (Old 51) about 20 miles south of Minocqua. The first 6 miles are on paved town roads. The remaining 20 miles follows the entire length of the Bearskin Trail with the course ending at the trail head behind the U.S. Post Office in downtown Minocqua. The 1/2 Marathon begins at Lakewood Road and Bearskin Trail. 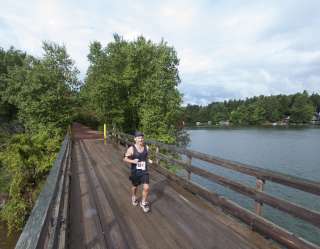 Both marathons enjoy the same unique trail. The Bearskin Trail is what makes this Marathon unique among races. The trail is a surface of crushed granite with no soft spots, and there will not be sidewalks filled with spectators. In fact, you will not see a single sidewalk along the entire route. What you will see is some of the most beautiful forests and scenery that Wisconsin’s Northwoods has to offer! There is one stretch of 9 miles of the trail without a road or driveway crossing.This stretch is the first 9 miles of the ½ marathon. This race starts a few hundred yards north of the intersection of Lakewood Rd. and The Bearskin Trail just north of Pinewood Golf Course. Spectators will not even have access to many parts of the course and will usually be friends or family of other runners when you do see them. You will see streams, lakes, balsam swamps, hardwood forests, marshes, open meadows, a golf course, old railroad bridges, and a variety of wildlife if you’re watching for them. The Bearskin Trail itself crosses 15 of these old railroad bridges and has a slight roll to its topography, but no hills to speak of. It allows you to keep a steady pace with plenty of passing room. We expect a lot of good times and many PR’s! *We want to give every racer the opportunity to finish with a recorded time, however, the timing company will only be able to keep their setup until 1 pm. If you think it will take you more than 6 hours to finish, please contact the race director. We will try to accommodate for those individuals a 6 am start time, 1 hour ahead of the main filed.